Description: HILLS, IA � June 14, 2008, Iowa Army National Guard Soldiers are working hard to complete a 7 foot sandbagged levy in order to protect an electrical generator from the rising floodwaters. There are approximately 80 soldiers sandbagging at the generator plant, including some with the horizontal engineers, medics and even the 34th Army Band out of Fairfield, Iowa. 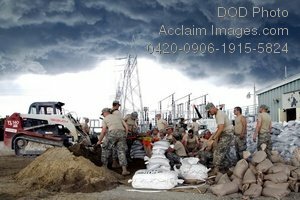 Stock photography by Department of Defense Public Domain.